I can’t believe its the festive season again, already! I have been a bit slow at getting into the Christmas spirit but here is the first of hopefully a few Christmas recipes. 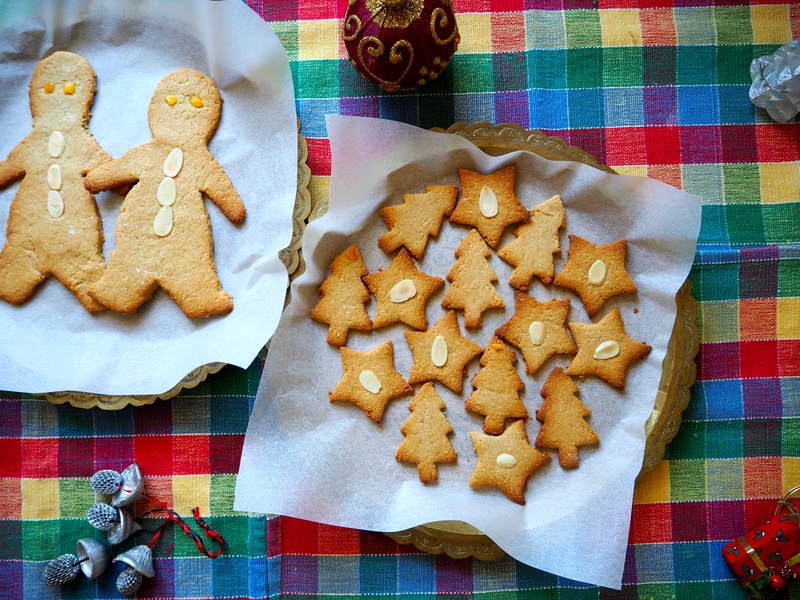 As of yet we don’t have a christmas tree up in our home but the smell of these cookies wafting around has reminded us that once again ‘its the season to be jolly’! 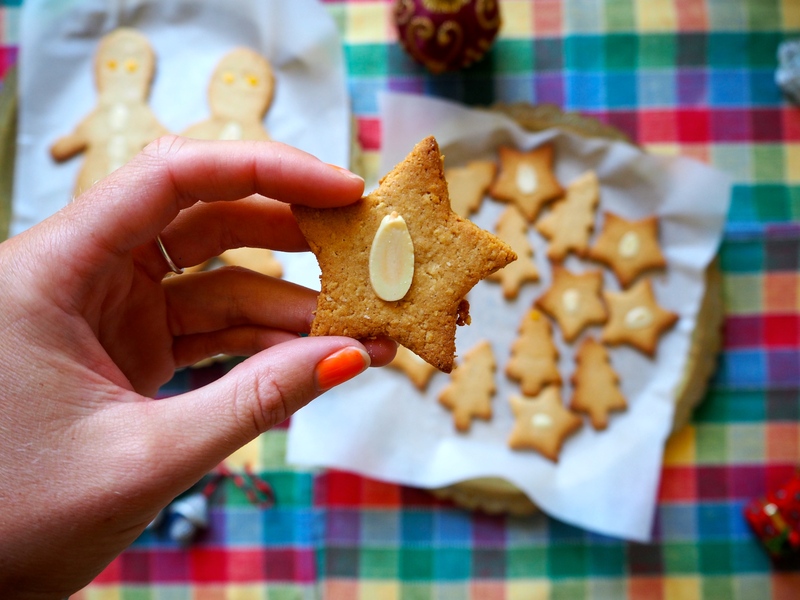 I wanted these cookies to be a mix between traditional gingerbread and shortbread but without the butter, eggs, refined flour and sugar. They are beautifully spicy, almost buttery from the coconut oil and with a lovely crisp texture, perfect for dunking in your afternoon cup of tea. I have shaped mine into a few giant gingerbread men as i had a really cool cookie cutter from my late Grandmother but regular gingerbread would also be delicious! I have also shaped some stars and christmas trees which are great presented in a little bag or mug as a christmas present. 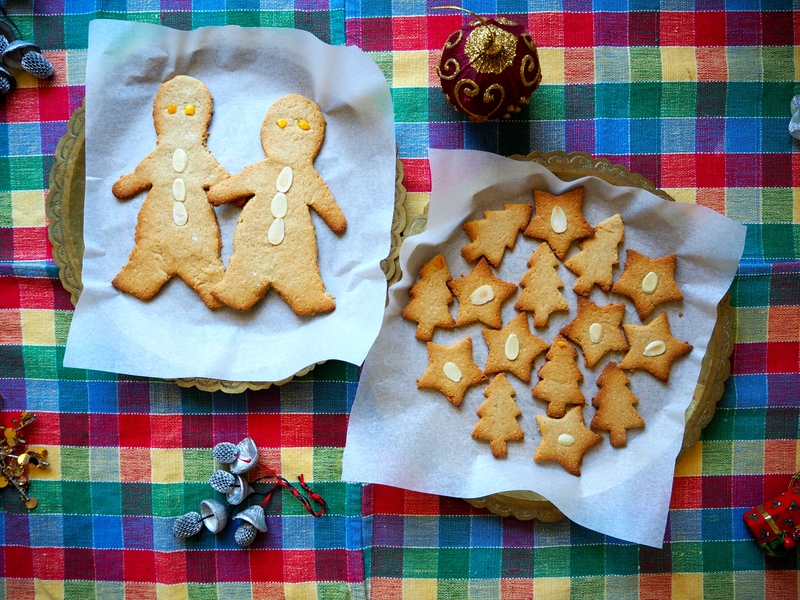 Get your kids in the kitchen to help you with this easy, healthy recipe and enjoy the start of a beautiful festive season! Preheat the oven to 170 degrees Celsius and line 2 large trays with baking paper. Pulse the oats in a blender/food processor to achieve a rough flour consistency. Place the oat flour into a mixing bowl along with the almond meal, rice flour, baking powder and spices. Combine. Melt the honey, coconut oil and vanilla extract over a bowl of boiling. Add to the dry ingredients along with enough plant milk to achieve a dough consistency. Wrap in plastic wrap and place in the fridge for 20-30 minutes. Sprinkle rice flour over your bench top and roll the dough out to roughly ½ cm thickness. Cut into shapes with cookie cutters. I used giant gingerbread, star and Christmas tress cutters. Use a little mixed peel and flaked almonds to make eyes and buttons. Carefully place onto the lined trays and bake for 10-15 minutes or until golden. Perfect served to impromptu Christmas visitors with a cup of tea.